The Amelia Island Lighthouse is in Fernandina Beach and overlooks Egans Creek, the St. Marys River and its entrance to the Atlantic Ocean. It is the oldest existing lighthouse in Florida. The lighthouse was built in 1838 using materials from the former lighthouse north of the St. Marys River on Cumberland Island. 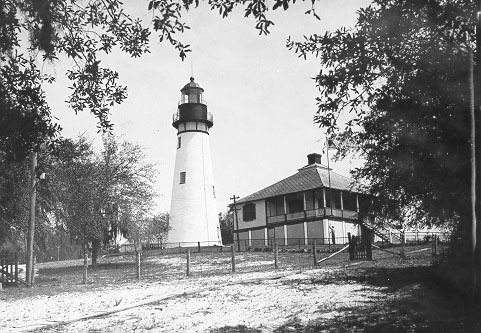 The U.S. Coast Guard transferred ownership of the lighthouse to the City of Fernandina Beach in 2001 and they maintain it as a historical monument. Access to the lighthouse is limited by the City as the structure is in a residential neighborhood and surrounded by houses. The lighthouse is open to the public on Saturdays for three hours. The City also offers tours to the lighthouse twice a month. The City does not allow visitors to climb the stairs in the lighthouse.